We all make mistakes with our published books, right? And we learn from them – well most of the time. Ouch. But he’s right, of course. When I published my first book in 2013, I’d had a website and two blogs for two years. And I’d been using social media for two years. Sounds good, right? While it appears that I prepared for my launch, like many authors I was focused on writing my book. Here’s a summary of five things I did wrong. The domain for my website was ACT Communications. Not a very enticing business name for writers, now was it? Although I’d been blogging for two years, one blog was for businesses. The second blog started out as a blog catering to nonprofits. I didn’t switch the theme of the second blog to writers until I published my book. So again, I wasn’t doing much to build my platform or prepare my audience, authors. The username on my Twitter account was ACT Communications. Worse, I was tweeting about social media for nonprofits and small businesses, and I wasn’t following many people, so my account was stagnant. My story gets worse. I was using a verification app that required anyone who followed me to use and be verified by the app, TrueTwit.com. If you’re using this type app, your Twitter account is basically frozen and will never grow. Therefore, your platform will stagnate. I followed the advice of a search engine expert and created a Facebook page for my book instead of an author page. His theory was that writers should have a Facebook page for each book they write. Now I know better. If I’d created a new Facebook page for every book I’ve written my audience would be divided, and I doubt that someone who liked my first Facebook page would like subsequent pages. Why would they? Several years ago, when Facebook first allowed pages to change their names, I switched my Facebook page to an author page, and I’m much happier. Now people can find my page by searching for my name instead of the title of my book. I signed up for the Kindle Select Program on Amazon and made my book available for free several days. But guess what? I failed to add my free book to a myriad of lists that exist to publicize free books. Relying only on my social media, I had 800 downloads but think of the thousands of downloads I could have had if I’d signed up for a variety of services that publicize free books. In my case, I did learn from my mistakes. Here are five things I do differently. I ditched the website ACT Communications and started SocialMediaJustforWriters.com. I focused my efforts on writers, especially indie authors. I sought speaking gigs, teaching social media to authors. So far I’ve taught through Stanford’s and UC Berkeley’s Extended Education program, I led a workshop at the Rocky Mountain Fiction Writers Conference and the Redwood Writers Conference (twice), and I’m a regular presenter at the San Francisco Writers Conference. I’ve also spoken to a variety of other author organizations and at bookstores. I seek guest blogging opportunities. I’m a contributing writer for TheBookDesigner.com, was until recently a blogger and the social media expert at BookWorks, and I’ve written for a variety of other blogs, including Joanna Penn’s, Jane Friedman’s, Nina Amir’s, and Susanne Lakin’s. This week’s Indie Author Update focuses primarily on book marketing. Be sure to read the posts by Dave Chesson on Kindle keywords and Joel Friedlander’s take on the release of Fire and Fury. I recently invited Penny Sansevieri to my Conversations with Frances webinar series. Below you’ll find a condensed summary of some of our conversation. Be sure to watch the video to glean all of Penny’s great suggestions. Book selling strategies vary depending on the genre and title. But what we know is 95% of books are sold by word of mouth. So look at getting reviews. The No. 1 thing she recommends is building your list of super fans or a street team. 99% of authors don’t market their books. A good measure of authors believe in the field of dreams theory … that because they wrote a book, readers will come. Authors need to turn to their super fan base to get them to review books. You don’t need a huge list as long as your readers are fanatical about your writing. One way to build a fan base is to include a letter in the back of the book and ask readers to contact you. The next step is to add them to your email list and start communicating with you. Then start asking them questions, such as what they want to see in your book or let them help you to select a book cover. They in turn get exclusive deals. For example, give them a free book two weeks before a book goes off presale or a tote. According to the book The Curve, you need 1,000 super fans to get on the New York Times bestseller list. Nowadays, it’s easier to connect with readers due to social media, email, and video. Book launches are very important but the most successful books are those that are promoted over the long term. Pre-orders are fun but once the pre-order is over sales can drop and that can in turn will hurt sales. She loves to re-launch books. Sometimes you can split up books and create a series. Consider refreshing a cover. Update the content. Book series are doing better than movie series. Always pitch bloggers for reviews. Reviews continue to help your amazon visibility. Amazon is just a search engine and it responds to the same cues as Google does. Continually reach out to readers, ask readers for reviews, and do speaking engagements. Give out character trading cards. How should authors use social media to promote their books? There’s a lot of noise out there that’s not productive. You need to remember that it’s about conversations. Also, it’s not about being everywhere but being where it counts. Cut out the useless noise and get rid of the social media sites that are doing anything for you. In some cases a video connection can be great. Start to research similar authors in your genre. You want to find what social media sites they are on, where they’re getting the most momentum, and invest your time there. Be sure to talk to your readers on social media. The Next Webinar is January 11th! Sharon Hamilton started writing several years ago on a rainy day. It’s wasn’t long before she was publishing, writing more books, blogging, and achieving success as an indie author. We’ll follow the trajectory of her career and the factors that contributed to her success in this webinar. Join us on January 11 at 11 am PST / 2 pm EST. Do you want to sell more books? Every author does. I know that I do. The truth is, we can never sell enough books, right? It would always be great to be able to sell another 1,000 books, or 100,000 more, or maybe even 250,000 more. Or even 100 more. Indie writers regularly contact me wanting to know how they can maximize sales of their books. Some of them dream of the day when their writing can support them – a lofty goal. If you look at the great success stories of today’s indie authors, they support their careers with writing nonfiction or teaching courses. 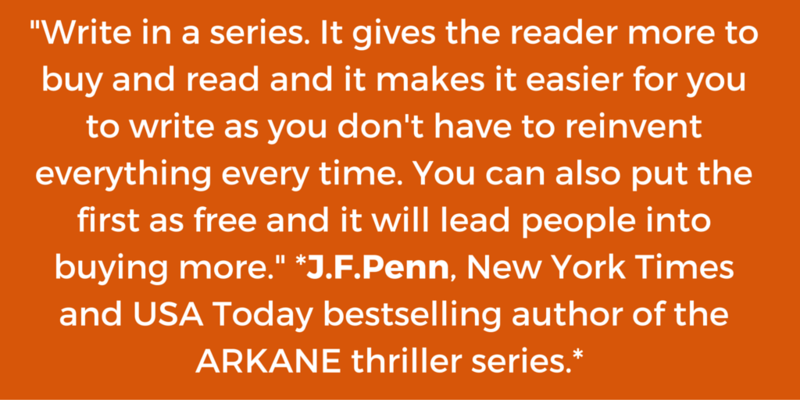 Look at thriller author Joanna Penn as an example. She has sold almost 500,000 books around the world and in five different languages. She’s also a New York Times and USA Today bestselling author and was voted one of The Guardian UK Top 100 Creative Professionals in 2013. Also, she has a successful podcast, The Creative Penn. For all her success, her additional endeavors — courses, nonfiction books, speaker fees — also support her business. The same is true for novelists Mark Dawson and Nick Stephenson. My point is that to make a living on your writing is possible yet a difficult goal to attain. Some think that social media in and of itself will sell all the books they want to sell. (Mistake.) Others think reading gigs or guest blogging opportunities will do it. The hard truth is that there isn’t an easy answer. If there were one, I would share it here. Honestly. And there isn’t a pill that will suddenly make you a capable marketer. The truth? It takes a lot of work to make it in the publishing business. But, hey, please don’t let me discourage you. That isn’t the point of this post. What I’m trying to say — perhaps not so eloquently as I’d hoped — is that to sell books as an indie author you need a comprehensive plan. Ready to roll up your sleeves? Keep reading then. After you undergo the grueling process of writing a book and paying for editors and designers, your have to put on a new hat, that of marketer. If anyone thinks that writing a book is tough – and a lot of people do – marketing a book is just as hard. It was such a wonderful week on the web for book marketing advice for authors. I selected a whopping five posts to share today because of the cornucopia of great content for authors. The big news of the week? Goodreads is testing the inclusion of Kindle ebooks in its giveaway program. This will be huge for indie authors. Plus, I loved being interviewed by Lorna Faith. So check out the show notes, podcast, or video. 10 (Practically) Cringe-less Self-Promotion Ideas for Authors from Publishers Weekly and by Kimberly Dana: “Self-promotion is fraught with the cringiest of awkward moments, but my more experienced comrade was right. Combing the social media circuit in search of friends, followers, and readers isn’t just necessary; it’s an integral part of the average author’s day. I consoled myself with one small, comforting thought: I can at least be smart about it.” Note: Kimberly Dana offers some tangible steps for indie authors to follow. The new marketing dictum for selling your books or anything else is this: You don’t need to be everywhere; you need to be where your readers are. Remember that. Otherwise, you’ll waste time. Focusing your energy and time on the social media websites where your readers network is your first rule. There are plenty of experts who disagree with this theory. But think about it. No one has the time to be everywhere. Let me qualify that. If you have a virtual assistant, housekeeper, personal chef, and driver, you have the time to be everywhere online. But Indie authors like you do everything themselves. To be economical, many writers create their book covers. Every author, once a book is published, then handles the marketing and publicity.